If you haven't noticed yet, there are some new changes to your Dashboard >> At-A-Glance tab. The first thing we did (and this was a while ago) was we made that page "responsive", so that it has a more useful appearance on small screens (phones). This tab started out with just a few boxes, but has grown a lot over the years. And recently, we've received a lot of feedback that it is "busy", overwhelming, and difficult to zero-in on the data you need to see. 1) You can turn off boxes that you don't care about or aren't using. 2) You can change the colors of the title bars, to help your eye be drawn to the data you are looking for. 3) You can also re-arrange the positions of the boxes. What are your thoughts? As always, we welcome all (constructive) feedback. Yes it is possible, and thank you for the suggestion Earl. Look for it soon (we are hopeful for tomorrow (Fri) morning). I dont see the option to filter by date or property anymore. Has that been taken out with with the new changes? Thanks! 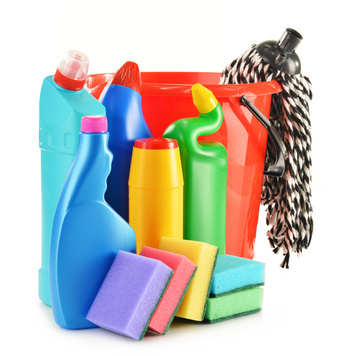 Clean/Inspect - previously i could select a date range to identify required forthcoming property cleans. However this doesn't seem to be possible now. Not sure what "Received " means or is supposed to do but its not working for me. I'm selecting dates but no properties are generated, but should be. Sabeli Villas - when you selected a date range before, what data came back, exactly? Was it "anticipated" clean/inspects? Or was it clean/inspect activity that had been reported during the selected dates? The date range gave me the proposed "Check-In's", which in turn gave me their Last Cleaned and Last Inspected. I believe the Clean/Inspect box has been confused with the Payments Received box. "Received Dates" should be Check-In Dates" because nothing is being identified. It would seem that the filter/config for the Clean/Inspect box should present the option for Arrival Dates instead of Received dates. We are going to roll out an update for that tomorrow morning. Please let us know if that rectifies the issue. Thanks. Just curoius if there could be a custom box added. So we can call it what we want. For example I have to request keys on my rental agencies website and I am trying to figure out how to track which renters I have schedueled their key service. OR maybe there is a utility that I just dont't know about? I do appreciate all the changes that were made on the At a Glance page. It has been very helpful in organizing, thank you! Hi melissarob - that would have to be a new box we would create, and it's non-trivial. Email me about this and we can explore what options that may help you. Is there a way to create a booking straight from one of the inquiries on the at a glance box? When i click on one of the inquiries i don't see a book now button. Yes - we inadvertently made those buttons (Create Booking, Create Booking Request) disappear for another glitch fix, but we are correcting it with tomorrow (Wed.) morning's update. Sorry! Hi John, I'm using the Scheduled Notes, to identify my daily cleaning requirements. It would be helpful if you could add a tag "Property" or "Property/Guest". At the moment you have to actually go into the Booking Ref, to see which property it is for. I would suspect this would also be useful for General as well as Housekeeping. Thanks. We are happy to announce that VacationHomeRentals.com has been added to our growing list of channels that Bookerville integrates with nicely, including our much-acclaimed Auto-Responder. 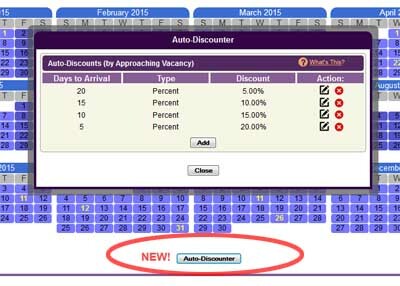 We have also made several key enhancements to our already legendary Auto-Responder, including showing the availability calendar when the guest's requested dates are not available. This allows them to easily and visually determine if they might want to alter their dates in order to squeeze into your great rentals! Also note - it is our understanding that VacationHomeRentals.com reads Bookerville's standard iCal feeds so that your calendars are automatically synchronized. Nice huh? As always, if you need any help, please let us know. FYI, the payment received e-mail template "Payment Recieved - Thank You!" has the word "Received" misspelled.... could you please update this? Thanks in advance for your response. Thanks for the heads-up Anthony, we've corrected it so that future new properties will get a corrected Payment Receipt email template. You can correct yours by simply going to the Property Setup ==> Email Templates tab, and opening the Payment Receipt email template for editing. How do you set up the auto responder through Vacation Home Rentals when there is only one email address available to enter. So I can't enter my regular email address and then another bookerville address in the setup. I'm still having the same issue with the auto responder for Vacation Home Rentals/Trip Advisor. Is there a way to set up the auto responder with them now? Some updates have been made to our Housekeeping functions. As the main owner of your Bookerville account, you now have full cleaning and inspection permissions on all your properties by default. This means you can click on the "My Clean/Inspect Property List" link in the lower-left area of your Dashboard ==> Master Calendar, and it will take you to the same page your cleaners/inspectors see. From there, you can mark properties as cleaned/inspected yourself. 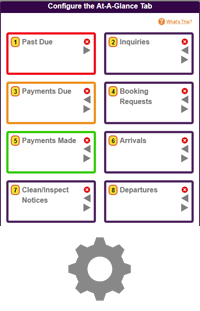 You can also click on the "Clean/Inspect Status" link (upper-right area of Booking Details page) to see the status as it pertains to a specific booking. And there you can also add to existing comments, or mark as clean or inspected yourself. You can also delete cleanings or inspections, if they were entered by you. We are going to be enhancing the My Clean/Inspect Property List page so that when you tap a property, instead of going straight to the Clean/Inspect Report form, it will first show you the most-recent booking, the current booking (if there is one), and the next booking. You'll be able to choose which of those bookings you are about to report on, which will help prevent mistakes and confusion. As always, we encourage you to give us your thoughts on how this can be improved. So don't hesitate to comment right here, or email or call us with your ideas - they are valuable! It would be extremely helpful if the marking of Cleaning/Inspections generated an email notification to the property manager and/or owner in a fashion similar to other automatic emails. John, Have been playing around with Maintenance Option and just trying to get my head around it. 1.As I understand it, from the Housekeeping App a Maintenance request can be generated, with Description, which then generates a Works Order record/number which pops up on the At-A-Glance screen as notification to Prop Man. How can I then forward on this W/O complete to the relevant Maintenance area. I don't seem to see a Tag to insert into an E-mail Template. The Email Trigger is working, but how do I link/include the W/O. 2.How do you update the fields on the Works Order ie. Schedule, Completed, Status, Estimate, Paid. Or is this not available yet. System just keeps chucking me out. 3.Is there going to be a separate Works Order Report. As nothing appearing under the Clean/Inspect Rpt. Only if I complete the Comments Section as well as Description on the House Keeping App. 4.Pro Man's can raise a Works Order also via the Master Calendar Screen, but I cannot see that it is possible from an individual booking. The Clean/Inspect Status only allows comments to be updated on previous reports. Could this be a possible new feature. Thanks John keep up the good work. Very good observations, and thank you. You are correct, that there is not yet a way to assign work orders to individual people yet. But that is in development and will be available soon. There is also no way to email these yet either. You should be able to edit any work order by either clicking on it from the Work Orders box on the At-A-Glance tab, or going to the Property Setup page >> Work Orders tab. Look for the little edit icon, which is next to the delete icon (red X). Try that and write back with your thoughts, thanks! How nice would it be if Bookerville automatically created new expense entries for you whenever new bookings happen? Well guess what? We have rolled out some new updates to accomplish just that. 1) You can now flag certain expenses as "Owner Paid", in the Expenses tab in the Property Setup page. These are expenses that you would "pass-through" to the owners. This will cause them to appear on the new Owner Statement Report that is being developed. 2) On that same Expenses tab, under the usual table at the top where you enter property-specific expenses, there is a new table called "Recurring Expenses:"
Here you can establish expenses that will get automatically created for you with every new booking that is entered (either by you or by guests, if you're doing online booking). This will be helpful for things like your commission, perhaps cleaning fees, linen fees, pool heating/propane refills, and other expenses which recur with every new booking. 1) Recurring expenses that are dependent on guests choosing some option (Pet Cleaning Fee, e.g.) are not yet supported. That is planned for a next step. 2) Only actual bookings will get expenses automatically created for them: Booking Requests do not, but they will if/when they ever become actual bookings. 3) Once you've established these rules, they will start getting created with bookings entered thereafter. They will not get created automatically for existing bookings. However, on the Booking Details page, there is a button to "Re-Generate" expenses, which can help expedite retro-fitting these expenses to existing bookings. As always, let us know if you'd like help doing this. We know this is a lot to take in - it's an ambitious new feature we are trying to automate here. Please don't hesitate to call me for help in understanding and/or setting this up. We also want to thank those members who have worked with us on this for their painstaking feedback in helping us develop this new automation. Please do weigh in here on this topic with ideas, suggestions, concerns, etc., or email us if you're more comfortable with that. 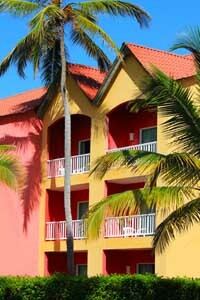 What Are Vacation Rental Property Features and Amenities? Bookerville is pleased to announce that you can now enter the features and amenities of your vacation rental properties. Not only does this include things like number of bedrooms and bathrooms, pools, hut-tubs, grills, and internet/WiFi, but also things like short and long descriptions, local attractions, whether your property is beach-front, lake-front, and even your Google Maps URL. Why Should You Care About Features and Amenities? We are encouraging property managers to enter these property features and amenities, as it will help Bookerville promote and market for you. It will also open the door for more convenient integration with websites, listing sites, booking agencies, and more. 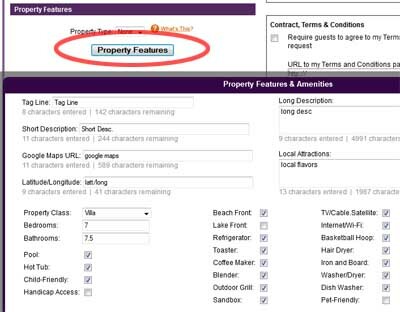 Even though we may be adding to and tweaking this feature over time, it's important to get your property features entered now so Bookerville can begin promoting them for you. What Will This Do? What Does it Cost? Bookerville will use this information to help various people - including tourists, agents, listing sites, etc. - to search and filter their results. This powerful convenience will help more people to find your vacation rentals. Of course, if you have elected not to participate in active promotion, then it will not affect you. And there is no additional cost for Bookerville's active promotion of your properties: you have nothing to lose and much to gain! Please let us know if you need any assistance, and of course we welcome and encourage your feedback.